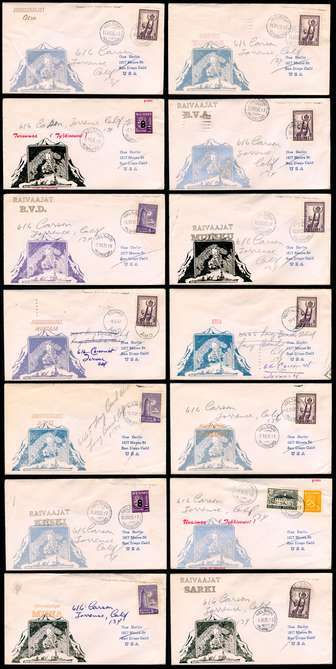 1951 collection of 14 Finnish NAVAL SHIP covers to the U.S. Such ships (mostly small) seem to rarely have had postal facilities, thus they are usually canceled (or sometimes not at all) at the next port of call. All with ornate cachets stating the ship name. Upon arrival in the U.S., these were forwarded which makes them look a bit messy, but as a result, most received a U.S. transit postmark on the reverse, proving that they did go through the mail -- such covers are rarely seen with arrival/transit postmarks. Individually these would sell for $10-15 each. 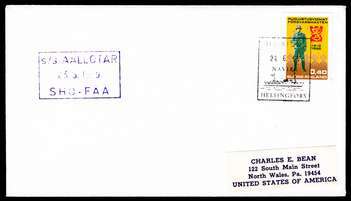 333 [1955 15m Telegraph] (VF) solo use on 1956 philatelic SHIP COVER with Finnish postage, sent to Sweden, presumably posted on board a ship. Upon receipt in Sweden marked with black straight-line postmark "Med båt från Finland" [by boat from Finland]. 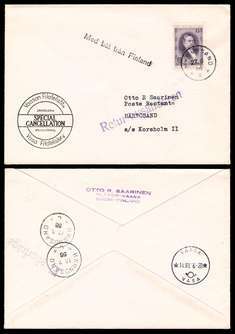 Addressed to Poste Restante [general delivery] in HÄRNOSAND, SWEDEN, and canceled there, and giving the name of a ship, the "s/s Korsholm II". Delivery not possible and could not be forwarded (marking on reverse) and returned to sender (marking on front). With Finnish receiver for the return. Though a philatelic creation, quite interesting postal documentation. 473 [1968 40p Soldier; National Defense] (VF) solo use on 1969 philatelic cover from Finland to the U.S., posted on board the "s/s AALLOIAR" (Finnish passenger ferry) and with ship handstamp, put ashore at HELSINKI where it received a Helsinki pictorial ship NAIVRE (i.e. PAQUEBOT) cancellation. This naivre / paquebot cancel is seldom seen so clearly struck.